Saturday 2nd December 2017 proved to be a landmark day for Peakirk village. For several years we have been trying to raise funds to install a Community Defibrillator and finally with the help of the Community Heartbeat Trust we have achieved our aim. The training was provided by Wendy from the CHT who went through the basics of what to do in an emergency and how to get help. She explained how the machine works and gave us all confidence to handle it. It is fully automatic and WILL NOT LET YOU DO ANYTHING THAT MIGHT DAMAGE THE PATIENT FURTHER. The amount of support in the village for this project was evident in the large turnout of people who gave up their Saturday afternoon to learn how to save a life. Thank you all, let’s hope we never have to use this knowledge! A couple of people were concerned that if they tried the defib machine and the person died, they could be accused of being legally responsible. No. The rescuers are covered by 3 elements of law. Firstly they will have called 999 ambulance. Under the NHS LA TPLS scheme, any member of the public being asked to assist an NHS organisation is being deputised and therefore come under all the insurances and protection of the NHS. As they have to call 999 ambulance to get the device, all users are covered. Also the SARAH Act 2015 gives additional cover for any rescuer involved in a life threatening situation, eg Cardiac Arrest. Thirdly the law over suing. To enable a lawsuit to be brought, the litigant would have to prove negligence. In order to do this, they have to show that whatever action was taken resulted in a worse outcome than the natural course, in this case death. You cannot get worse than death. In addition the person is already dead…the rescuers are trying to bring them back to life. So no cause for worry here. 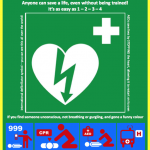 No-one (anywhere in the world) has been sured for using a defib. Another person raised the point that if the pads were used on a child who was younger than 8, in the wrong position and they died could the parents blame the responder? Again No. The pads are placed in the same position top right bottom left, or the alternate position of front and back. If in doubt place front and back, even on an adult. This is clearly described in the instructions. 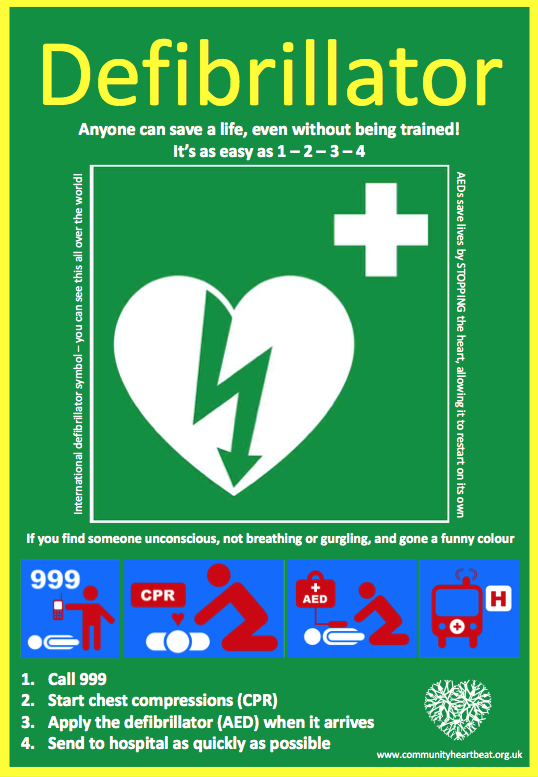 However the chance of anyone using a defib on an under 8 is very very very very low. In a typical UK village, there us a cardiac arrest in an under 8 about every 3000 years….. Again just follow the same as above. Call 999 and follow the instructions given by the ambulance service.